Nancy Krebs' song "Humility" is doing well on the numberonemusic.com charts this week. Check out this song and the rest of her music at iTunes. 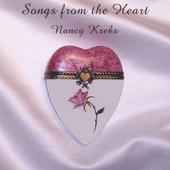 Nancy Krebs is a Christian singer-songwriter specializing in original acoustic meditational music. The feel is quiet, but the thoughts behind the songs create a powerful emotional reaction! Nancy Krebs started singing at age 3, and hasn't stopped yet! When she was 12, she began playing the violin. That soon led to the guitar and eventually the mandolin. In high school, Nancy began to write songs for Folk Masses and other church services. Ignoring a strong calling to compose full time, she actively pursued a career in theatre, film, radio and TV. Nancy has performed with professional regional theatres such as Center Stage, Alaska Repertory Theatre and Meadowbrook Theatre. She was a member of the Emmy award winning TV series for PBS called Once Upon a Town.